Ok, so the first part of the experiment did no go according to plan. One can only hope that Part 2 will be conducted with a little more dedication and decorum. Part 2 – where runawaykiwi acts as an impartial judge presiding over the realm of chocolate. 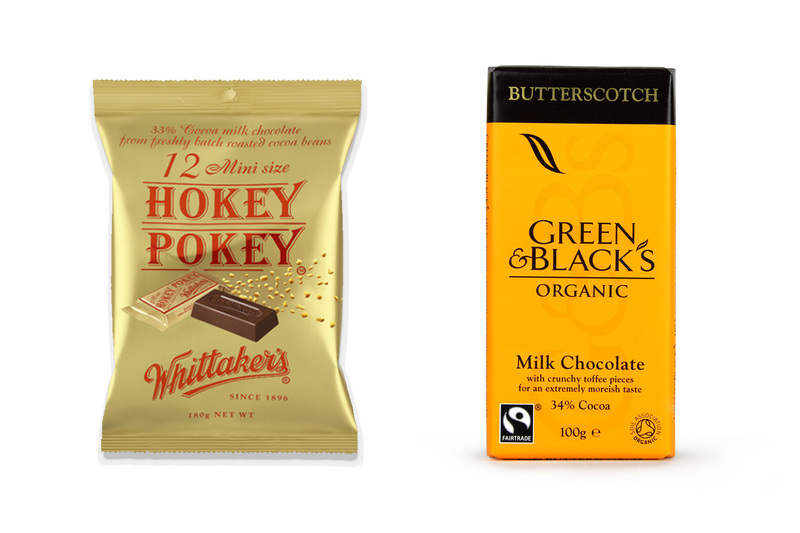 Hypothesis: although Green and Blacks is runawaykiwi’s drug of choice while in London, the cultural significance* of Hokey Pokey will cause Whittakers to come out on top. Method: a special analysis of both types of chocolate will be undertaken however no mention of ingredients or ‘which is better for you’ will be made**. All observations will be under test conditions***. Results: Whittakers first, the small size is just perfect – large enough for a chocolate fix but small enough to not feel guilty. The hokey pokey bits have a rough home made texture (not like the tip top ice cream) which are a bit harsh on the tongue. The chocolate itself is the classic sweet milk that Whittakers does so well. The ratio of bits to chocolate was perfect. Green and Blacks was a thin bar, lovely and delicate but a little less ‘on the go’ friendly. I have fallen head over heals for the butterscotch, such amazing flavour and very smooth little nuggets. The chocolate itself is on the darker side of milk, and since I am normally a dark chocolate girl this was right up my street. This is the type of chocolate that you could serve at a fancy dinner with wine. Conclusion: Even though I love the mini factor of the slab and it reminds me of home, the stunning darker chocolate of the Green and Blacks means it is the winner on the day. Ultimate Great Experiment conclusion: Although Part 1 and Part 2 answer a lot of the questions we all had in regards to chocolate, I feel an in depth analysis of the entire Green and Blacks range is needed*****. *Hokey Pokey to New Zealanders is like Apple Pie for Americans. ** if you are really worried about that, put down the chocolate and go and play with some broccoli. ***Watching Doctor Who ‘the Power of Three’ while sitting on the floor****. ****The sofa in the flat is cream coloured and I would not live past sunrise if I got chocolate all over it. *****I can not emphasize enough, this is all in the name of science, I am only eating all this chocolate so that you don’t have to.